The AquaSwimJet is connected to the AquaPowerPac via two 4 inch PVC pipes for incoming and return water. 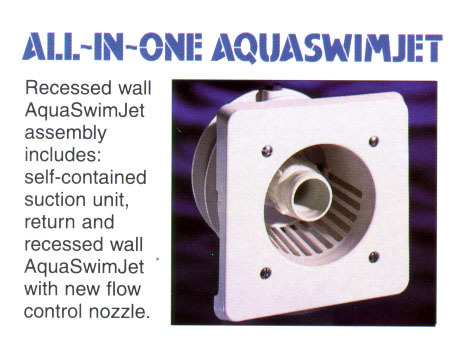 The flow of the water is controlled via turning the nozzle in the middle of the swimjet. While the pump is off, turning the nozzle clockwise reduces the flow and counter clockwise increases the flow. The flow of water obviously is not allowed to be turned off via the nozzle. The swim pump is turned on and off via an air button located at the edge of the pool. By adjusting the flow of water and the amount of air which is allowed into the flow (a knob located at the water's edge) one can adjust the water pressure and flow to accommodate individual swimming requirements. You typically swim back a couple of feet away from the wall with the swimjets and it will take a little bit of time to find your rhythm which matches your settings. The swimjets are also very useful during static aerobic exercises, having the water flow in the swimspa forces you to work harder.